Gysler’s history in Weinheim dates to 1450, with record of winemaking dating to 1750. The windy, cool microclimate of Weinheim, and its red soil dominated by Rotliegend sandstone, allow Gysler to ply a quite unique expression of Riesling from his 12 hectares, in a region planted to many lesser varieties and hybrids. 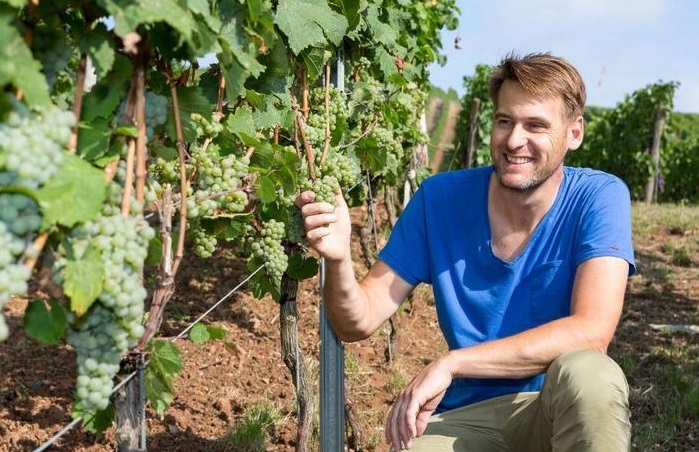 When Alexander Gysler took the helm from his father abrubtly, changes were made in the vineyard, including the reversal of the plantings of experimental crossings, instead focusing the estate by increased plantings of classic varieties such as Riesling and Sylvaner. Next came Biodynamic conversion and certification by Demeter in 2008, with the intention of helping to reverse the reputation of Rheinhessen wines as high-yielding, overly sweet ‘plonk.’ Fruit is hand harvested, which is rare in the Rheinhessen, and composting and cover cropping have become integral to the health of the estate’s vines – every second row is planted with flowers & herbs. In 2005, Gysler began bottling his wines in only 2 quality levels, estate and S-class, eschewing the pradikät system that portends quality is based predominantly on ripeness. Other changes include employing whole cluster pressing, spontaneous fermentations in stainless steel, eliminating fining and racking, gross lees contact right up until bottling, and abandoning the use of süssreserve. “2008 was the first vintage we did absolutely no handling of the juice,” says Alex Gysler.